Rick Sanders’ family honors his life on the 50th anniversary of his death. Vietnam Veterans of America’s Lary D. Fogle Chapter 71 in Aurora, Ind., participated in a special ceremony commemorating the 50th anniversary of the death of Richard Wayne “Rick” Sanders. Sanders was raised in Goshen, Ohio, and was serving with the U.S. Army at Nike Missile Base in Dillsboro, Ind., when he met his future wife, Sandy Cayton. She was still pregnant when he deployed to Vietnam, and his daughter, Dawn, was just seven months old when Sanders died in action. Sanders served as a paratrooper and combat medic and earned the Silver Star, Bronze Star, several Air Medals and a Purple Heart during his deployment. On Oct. 1, 1968, he was aboard a medical evacuation helicopter on a combat rescue mission near Tam Ky in North Vietnam when the chopper was shot down. His widow, Sandy, asked the chapter’s Marty Sizemore and P.G. Gentrup to help plan an event. 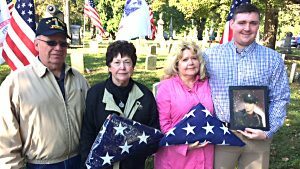 On Oct. 20, 2018, the family members met with the Chapter 71 Color Guard at Rick’s burial site at River View Cemetery. Gentrup read a prepared statement from the family and talked about what brave young men like Rick mean to the nation, as well as Rick’s citations for his Bronze Star, Silver Star and Purple Heart. The chapter provided full military rites. A burial flag was presented it to Dawn in honor of her father, and Sandy, Dawn and her son, Derek, were presented with Purple Heart Challenge Coins, 50th Anniversary Vietnam War Challenge Coins and 50th Anniversary lapel pins. Sgt. of Arms Marty Sizemore called the rifle squad to attention, and they fired three volleys before Taps played.